Since 2009 the company has donated $1 million every year to World Wide Fund for Nature (formerly World Wildlife Fund)(WWF) - $6 million to date. Among specific projects, money has gone to the Great Canadian Shoreline Cleanup with more than 1700 stores participating in the campaign across Canada. Sweater Day means to actually don sweaters as Loblaw corporate and participating franchise stores reduce their store thermostats by three degrees Celsius every February. In 2014 more than 500 stores participated. There’s also the Loblaw Water Fund, providing grants to organizations to help conserve, protect or restore fresh water habitats and their species. At Metro stores, a portion of the five cent charge goes towards the grocer’s Green Apple School Program which invests $500,000 annually in grants to Ontario schools. “Schools apply for grants, which are used to create programming that encourages healthy eating habits or provides access to healthy food,” spokesman Mark Bernhardt said. Despite repeated requests for comment, Sobeys, which also operates IGA, FreshCo and Price Chopper stores, did not respond. 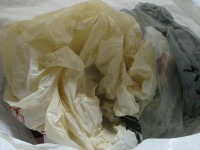 National drug chains also donate the fees charged for plastic bags to charities. At Shoppers Drug Mart, a portion of the five cents “is donated back to women’s charities and the remaining is invested in environmental programs,” spokeswoman Lana Gogas says. And at Rexall, a portion of the expense goes to the drug company’s own charitable foundation. “And then the Rexall Foundation as a whole makes donations out to a variety of different charities throughout the country,” spokesman Derek Tupling says.